Bloodhall Priest… How are you not into the new Inferno Titan, man? Mike isn’t sure if Vampires should play mono-red [madness], or mono-black (to make sure they can madness out and abuse Voldaren Pariah). Patrick has a different take: Instead of playing purely black or purely red, black should splash red and red should splash black. 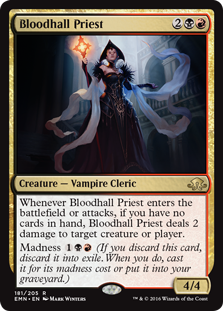 At least if you are dead set on Vampires… Bloodhall Priest is just too good! Worst comes to worst? Bloodhall Priest is a 4/4 for four mana with no real drawback. That’s not bad! Bloodhall Priest is a bit Obstinate Baloth-ish; that is, it is a 4/4 creature that can come down via discard… After all it has a madness discount. And it’s not like it’s off-theme! In addition to being an actual vampire for either black or red vampire choices, the fact that this card has madness gives it a natural synergy with either Furyblade Vampire (red) or Cryptbreaker (black). madness Madness MADNESS! Bedlam Reveler has a low floor… But also an amazingly high ceiling! One of the nice things we learn in “Floor, Ceiling, Bedlam Reveler” is that Mike doesn’t know what “a low floor” means, apparently. Patrick explains the — frankly common — metaphor and also how the low floor-high ceiling range applies to this great new Eldritch Moon creature. Make no mistake: The floor on Bedlam Reveler is slow. Its base cost is a blubbery eight mana. It can cost an awful lot of mana for a mere 3/4… And if you have more than three cards in hand? This Devil Horror can bedevil you, horribly. But when Bedlam Reveler is good? It’s so good. When Bedlam Reveler is on, it is both cheap and powerful. It’s like a red [“Red-red,” -Mike] Tarmogoyf… But that draws three cards. Or, it’s a Treasure Cruise — really, look at it — that leaves a 3/4 body. That 3/4 body in fact has prowess… Meaning that if your Bedlam Reveler ever faces off with a real Tarmogoyf it is dicey that the green version will ever dare tangling with it. The ability to grow during combat can be just too scary. Bedlam Reveler can play nice with Monastery Swiftspear, blue cards, and even free “pump” spells like Mutagenic Growth. Can you imagine attacking into an open Mountain with a first turn Monastery Swiftspear, drawing out a Lightning Bolt? “Mutagenic Growth?” That’s like countering their best card and forcing them to take four at the same time… By the way you’ve still got a Monastery Swiftspear. 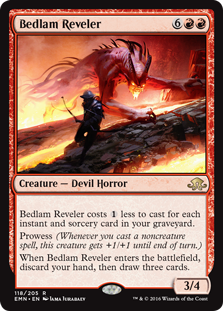 Bedlam Reveler is going to be good in Standard but possibly really scary in larger formats. 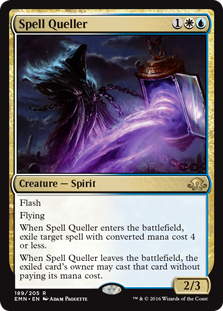 Modern and Legacy are both on the table with their Lightning Bolts (and blue cantrips). Liliana, the Last Hope might be everything you ever wanted in a three mana planeswalker. Liliana joins the Gatewatch in Eldritch Moon! 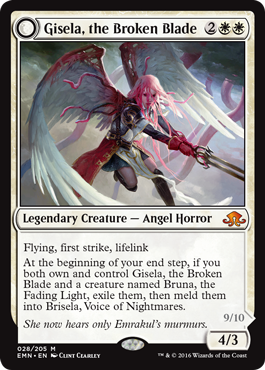 And by her nickname (“the last hope”) it seems like our Emrakul-opposing heroes might really need her help! But how about you? How can Liliana, the Last Hope help out your chances at winning in Standard? [+1] Liliana, the Last Hope gains loyalty with an ability that is already better than the one boasted by Jace. This ability absolutely mows down small creatures, can help you keep pace with the Plants in G/W Tokens, and might even invalidate the Standard version of White Weenie! [-2] Liliana, the Last Hope has a built-in card advantage ability, which is not trivial. The fact that this ability is only [-2] means that you can play Liliana and immediately use this ability without losing her. A Liliana, the Last Hope with a single loyalty can still be valuable, and you might have already gotten card advantage! A creature that you are actually aiming for is probably more valuable than a random card off the top of your deck; and remember, if you slot Liliana into one of Standard’s black control or midrange shells you might be getting back Goblin Dark-Dwellers! Boom. [-7] It is important to note that this ability scales quickly, and that the Zombie tokens enter the battlefield untapped. Oath of Liliana will bedevil opponents on turn three. How insane is Oath of Liliana in an Orzhov Control deck? Turn three Oath of Liliana, turn four Gideon? Double 2/2 defenders, anyone? Oath of Liliana is an all right card to begin with (capable of killing an opposing creature) and you don’t have to get paid off by 2/2 creatures very many times before it starts looking abusive. Gideon into Ob Nixilis into Sorin, anyone? 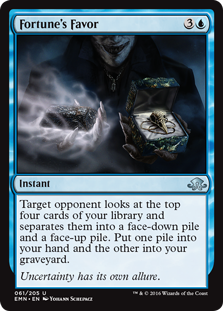 Fortune’s Favor is Our Eldritch Moon Preview! Fortune’s Favor is a nuanced new card from Eldritch Moon. Where does Top Level Podcast think it will find a home? This card is way — way — better than Inspiration. Even if you take an [inferior] face-up pile, that is just as many cards as Inspiration… And you will be putting more cards in your graveyard. Remember: Inspiration was close to good enough (if not good enough) for Standard for years. Bluffing! Mike thinks this is a great articulation of bluffing in Magic; sometimes you’re going to have to give the opponent a truly great pile, but if you play this card right, you can tie the opponent in knots. We don’t think there is a single, consistent algorithm for splitting Fortune’s Favor piles. Patrick thinks one of his default splits will be three up / one down (with the one being the best card sometimes, the worst card sometimes, and something else sometimes). He wants to dare the opponent to take the face-down one! This card will make it super easy for some decks to get Delirium. Mike thinks that cards like Descend Upon the Sinful will come online quickly thanks to Fortune’s Favor, enabling two-color control decks in Standard. A turn six or seven Emrakul, the Promised End will also be trivial to set up. You can always get a pretty good tonnage of cards. Want two cards? If you don’t care what they are, you’ll even get three sometimes. A Blue Skies deck… Fortune’s Favor can play best buddies with Docent of Perfection or Niblis of Frost, enabling them to out-pace even great offenses. (Like we said)… A U/x control deck; could be U/W, B/U or something else. A B/U Zombie deck; Eldritch Moon presents too many recursion or value opportunities for us to ignore this awesome line! Use Fortune’s Favor to fuel Haunted Dead or Gisa and Geralf for more and more card advantage. Top Level Podcast is mad about Meld this week! 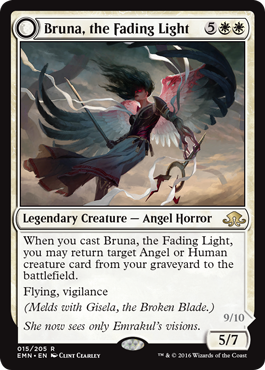 Because they are both legendary creatures, Thalia’s Lancers can set up either half of the Gisela-Bruna Meld combo. While the obvious synergy is to return a dead Gisela, the Fading Light to play (setting up the Meld) [and let’s be honest, people will be mad about killing your Gisela], because it is a human, you can instead return your Thalia’s Lancers to the battlefield… Which can then go and get another copy of Gisela, the Broken Blade anyway. The mad thing about these Meld cards? So many are just great cards on their own! 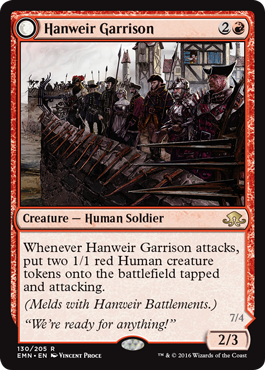 Hanweir Garrison is just a great threat… It’s very “Goblin Rabblemaster” if you take our meaning. 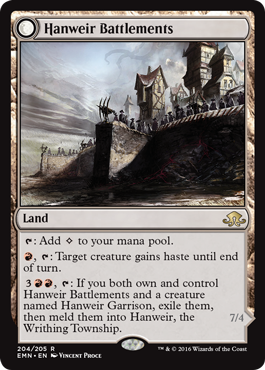 Hanweir Battlements is a land a ton of different decks would all want to play! Can you imagine a Gruul Ramp deck that played one copy? Holy hasty Dragonlord Atarka, am I right? How about finding a singleton copy with your Ulvenwald Hydra? I’d imagine you can imagine some creatures you might want to give haste to. Patrick and Michael go over not just Gisela, the Broken Blade but all the Meld combinations so far, as well as a smattering of newly spoiled, additional, Eldritch Moon cards.